Roll your cursor over the + button (above the course menu), and then click Content Area. Enter a Name for the Content Area, and then click Submit. Continue to build the Content Area page with content. 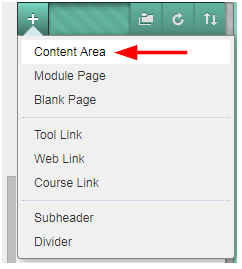 When you’re ready to make the content area available for students, click the down-arrow next to the content area in the course menu, and then click Show Link.